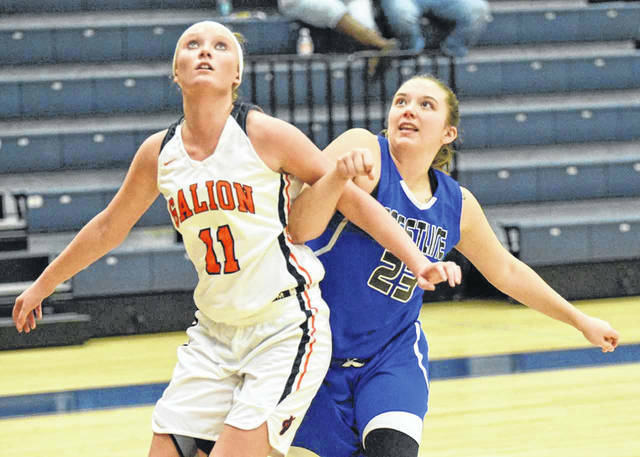 GALION — On Friday, November 23, the girls high school basketball season officially began as the Galion Lady Tigers played host to the Crestline Lady Bulldogs. Galion would make it 4-0 over Crestline in four seasons, including the last three season openers, by emerging victorious; 46-43. The win also marked the first victory for Lady Tigers head coach Shani Rush in her coaching debut for her alma mater. Things would start sluggish for both squads, which is to be expected in the first game of the season. Turnovers would be traded back and forth throughout the first quarter as well as much of the contest but after the first eight minutes, it would be the hometown Tigers on top; 13-5. In the second quarter, the teams appeared to settle into form but were still struggling to secure the ball on the offensive end. 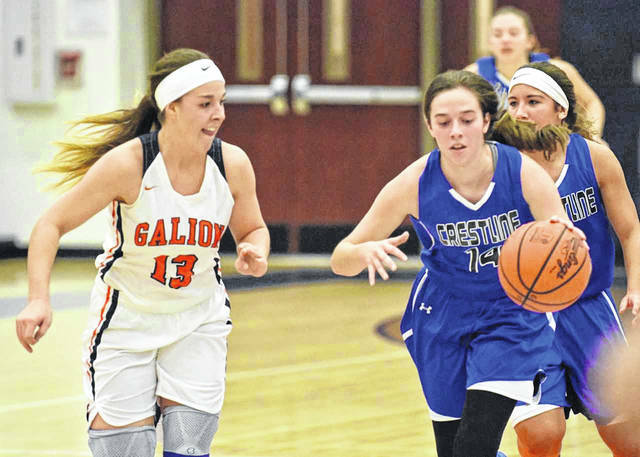 Defensively, both Galion and Crestline continued to work on their communication while still figuring the opposition’s next move while the respective offenses worked through the plays called by their coaches. As the buzzer sounded representing the conclusion of the first half, the white, blue and orange would head into the locker room with the 29-17 advantage. The big story at the end of that opening half was Galion senior Gracie Groves. Groves, who played most every second of the first two quarters, had already recorded a double-double by scoring a dozen and grabbing 11 rebounds. She would finish the contest with 14 points to go along with 23 rebounds, a steal, an assist and a pair of blocked shots. For Crestline, junior Lauryn Tadda was leading the way with seven points entering the intermission. Entering the third quarter, the Lady ‘Dogs appeared to be fired up after words offered by head coach Kyle Strauch at the break as they held their hosts to just eight points throughout the eight-minute frame while adding their highest output of the contest at 16 points to find themselves trailing by just four entering the final quarter of regulation; 37-33. Crestline looked to carry that momentum forward to put an end to their losing streak against the Lady Tigers but Galion had other ideas. Neither team posted large numbers in the final frame as free throws became crucial when both teams found themselves in foul trouble. Throughout the game, neither team would shoot particularly well from the charity stripe as the Bulldogs finish at 9/20 and the Tigers at 19/35. When the final buzzer sounded it was the hosting Galion squad snapping a 21-game losing streak with the narrow, three-point victory; 46-43. The Lady Tigers would see a pair of seniors lead the way as Groves and Gabby Kaple both contributed 14 points apiece. Crestline had a trio of girls finish in double-figures, led by a double-double from Tadda with 15 points and 13 boards. Kennedy Moore wrapped the night with 13 points and Alandra Tesso chipped in 11 points in the defeat. Other stats for Galion in the win on Friday were: Team- 46 points, 45 rebounds (22O, 23D), 7 assists, 10 steals, 5 blocks and 32 turnovers; Kaple- 5 rebounds, 3 assists, 2 steals; Teanna Greter- 9 points, 4 rebounds, 4 steals; Natalie Perkins- 5 points, 7 rebounds, 2 blocks; Heaven Phelps- 2 points, 3 rebounds, 1 steal and Morgan Kimble- 2 points, 1 rebound. Greter, Perkins and Phelps are all freshmen seeing varsity time early on in the 2018-2019 season for coach Rush and the Lady Tigers. “We kind of threw them into the fire,” states Rush of her young players making valuable contributions. “They work hard, they’re blue-collar workers…Teanna came in and made some baskets and her quickness on defense definitely helped us out. Heaven always gets after it and Natalie is pretty solid on the defensive end as well. Sure, they made some freshmen mistakes but hopefully by mid-season those will be long gone,” wraps Rush. Additional stats for Crestline Friday were: Team- 43 points, 23 rebounds (11O, 12D), 7 assists, 22 steals, 3 blocks and 20 turnovers; Tadda- 3 assists; 4 steals, 1 block; Moore- 3 rebounds, 6 steals; Tesso- 2 rebounds, 4 steals; Brianna Briggs- 3 points, 1 rebound, 1 assist, 4 steals, 1 block and Daija Sewell- 1 point, 2 rebounds, 2 assists, 2 steals and 1 block.